Diversified culinary offerings for every time of day and night, along with the perfect atmosphere, at the restaurants and bar and lounge at the Palais Hansen Kempinski Vienna. Seasonal dishes with international influences and regional products: Edvard’s Fresh Cuisine is aimed at getting the best possible taste out of every ingredient. 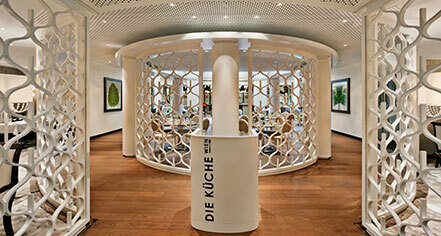 The restaurant is awarded with one Michelin star and 16 Gault-Millau points. The careful selection of products is equally important as the harmonic combination of all components to a complete dish. In addition, a wine menu, rousing the guest with a new appetite and a fresh atmosphere, was created for leaning back. The name is a tribute to the famous architect of Palais Hansen – Theophil Edvard Hansen. The restaurant provides 40 seats, tasteful stucco decorations, dark wooden floors, and fresh shades of lime green and white. Tuesday to Saturday, from 12:00 p.m. - 2:30 p.m. | 6:00 p.m. - 10:00 p.m.
International influences, Viennese classics, and a laid-back atmosphere make Die Küche the perfect venue for every time of the day. The restaurant is divided into three different areas and offers the perfect atmosphere for social events. There is a variety of offerings for guests, including the popular breakfast and the Pop-Up Cooking events. Interaction is always important, whether it is chatting between guests and chefs at “The Wishing Table” or at “WeinHochZwei,” which brings together wines and regional food every month and always featuring a vintner. Small groups can book the kitchen area exclusively for cooking events, get-togethers or parties. Breakfast: Weekdays, 6:30 a.m. – 10:30 a.m. | Saturday & Sunday, 7:00 a.m. – 2:00 p.m. Lunch: Monday to Friday, 12:00 p.m. – 2:00 p.m.
Dinner: Monday to Sunday, 6:00 p.m. – 10:00 p.m. The Lobby Lounge & Bar is the living room of the hotel and the place where the Viennese and their international guests meet. Whether it is the outstanding cocktails, delicious coffee specialties, or pastries from the in-house patisserie – for every time of day and night there is the perfect offering. 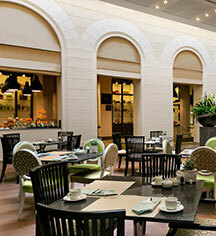 One of the highlights is the traditional Afternoon Tea – all following the British tradition. Pastry chef Georg Hölbl offers a mix of classics, such as scones with marmalade and clotted creams, along with his own creations, like a meringue with currant and tonka bean. Moreover, there is a comprehensive menu with only loose tea specialties from “Teehaus Demmer.” Some of the tea rarities are only available at Palais Hansen Kempinski Vienna. With its combination of historical columns and glass walls, the Cigar Lounge is a true architectural gem. In Vienna’s largest hotel cigar lounge, aficionados can choose from a wide selection of fine cigars, from Bolivar to Partargas, and also permanently rent their own humidors. Comfortable and communicative, the lounge also offers aromatic cognacs and choice whiskeys and rums.